Foreign body (FB) ingestion in the gastrointestinal tract (GIT) is commonly seen among children, alcoholics, mentally retarded individuals, prisoners, drug smugglers, and in people wearing dentures. However, about 80% of them excrete the involved FB safely without any significant complication. Observed complications include intestinal obstruction, perforation, bleeding, or fistula formation. Therefore, we present two cases of an unusual presentation of foreign bodies (FBs) in the GIT. The first case was a 14-month-old boy whose complaint was the inability to swallow; the only physical finding was epigastric tenderness, but chest X-ray revealed a radiopaque FB extending from the chest to the upper abdomen; the second case was a 25-year-old man who accidentally swallowed a toothpick, and this perforated the small intestine. Both cases had emergency laparotomy and the FBs were removed. The gastrointestinal tract (GIT) is among the common sites of foreign body (FB) impaction and this may result in GIT obstruction or perforation in both children and adults. However, this is commoner in children between the ages of 6 months and 3 years; this is the period when mouthing of objects (FB) is commonly observed in children as they explore their environment. In adults, common causes of FB impaction include food boluses, chicken or fish bones and denture, others are toothpick, coins, buttons, or pins; similarly, gastrointestinal diseases such as eosinophilic esophagitis may heighten the risk of food impaction. An estimated 40%–50% of FB ingestion is unwitnessed in children; therefore, a high index of suspicion should be entertained in such related clinical scenario such as sudden onset of respiratory or gastrointestinal complaints. Complication such as perforation occurs in <1% of ingested FB; this is mostly associated with long and sharp ingested objects. Occasionally, cases of child abuse may manifest as FB ingestion; therefore, all possibilities should be entertained and proper evaluation done. GIT perforations usually occur at regions of anatomic narrowing or angulations of the gut such as the esophagus; and around the region of the ileocecal junction in 83% of cases, however, Singh and Gardner reported three cases in the sigmoid colon. A 14-month-old boy presented to our emergency unit with 3 days' history of difficulty in swallowing semi-solid food, there was no associated respiratory symptoms, no fever, no abdominal swelling, and no history of trauma; there was no history of witnessed ingestion of FB or corrosive substance before the onset of complaints; he was from a polygamous family setting, however there was no history of family disharmony. Physical examination was not remarkable [Figure 1]; and there was no evidence of trauma, except for tenderness at the epigastric region. He had initial chest X-rays which showed a radiopaque nail lying in the lower chest region extending toward the stomach [Figure 2]. He was prepared for emergency exploratory laparotomy and the nail was extracted through gastrostomy incision; the nail measured 14.2 cm [Figure 3], and there was no evidence of perforation. He also underwent right posterolateral thoracotomy to exclude esophageal perforation because the tip of the nail was in the esophagus. Methylene blue was used intraoperatively to exclude esophageal perforation. The patient improved and he was discharged on the 7th postoperative day. A 25-year-old student presented to our accident and emergency unit with a history of right-sided flank pain which started 3 days after accidentally swallowing a toothpick while drinking coke. On physical examination, he had abdominal swelling and generalized abdominal tenderness; these were suggestive of peritonitis. He underwent exploratory laparotomy and a toothpick was seen; this had perforated through the wall of proximal end of the sigmoid colon. It was extracted [Figure 4] and the perforation was closed with Vicryl 2/0. He was discharged on the 6th postoperative day. FB in the GIT can cause gastrointestinal obstruction or perforation; FB impaction may occur at any part of the GIT, but the esophagus is the most common site in children this was observed in our first case; the nail caused partial obstruction of the esophagus leading to dysphagia. However, the circumstance leading to the ingestion of the nail was not clear in the index case because this was an unwitnessed event. 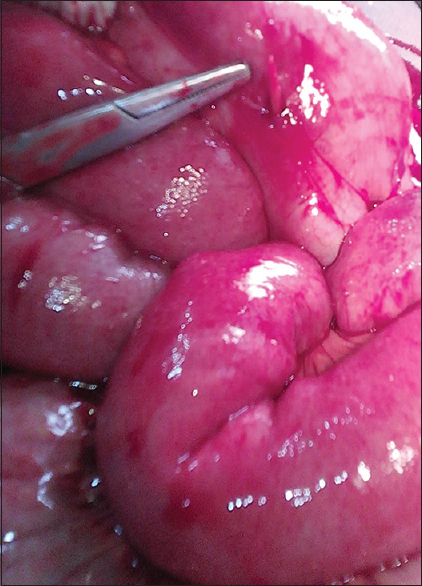 Gastrointestinal FB ingestion may be asymptomatic in 90% of cases, but in symptomatic cases, the complaints often depend on the site of impaction, the nature and size of the object involved, and also the duration of ingestion. Difficulty with swallowing may be associated with esophageal FB obstruction; however, respiratory complaints such as cough and difficulty in breathing resulting in misdiagnosis have been reported in esophageal FB ingestion. The exact timing of FB ingestion could not be ascertained in the index case. Several objects have been implicated in FB impaction; Yamamoto et al. in Japan reported an 18 cm chopping stick embedded in the wall of duodenum of a 71-year-old man for 60 years. However, other object such as lead battery which usually dissolves within 2 h and generates hydrogen ion at the anode may cause chemical burns., Therefore, early removal is recommended. 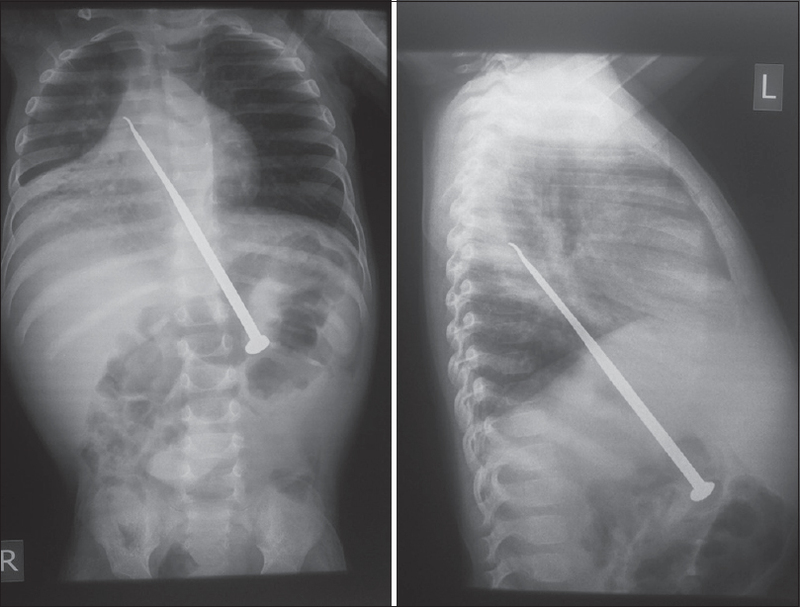 In the first case, how the nail got to the esophagus still remain a mystery to us, although suspension of possible child abuse was entertained this was difficult to substantiate. Despite the elongated and sharp ends of the nail, no perforation was seen intraoperatively in both the esophagus and the stomach. While in the second case, the toothpick perforated the sigmoid colon; this observation was similar to that reported by Cleator and Christie. Surgical removal is indicated if FB stays at any site for >5 days or if it is symptomatic. In both cases, they were symptomatic, therefore, they all had emergency exploratory laparotomy and the FBs were removed. Simple closure of the sites were done and they all made remarkable improvement after surgery. Both patients were discharged within a week of admission; these observations were similar to the case reported by Perelman. GIT-FB ingestion may occur in unusual circumstances as were observed in both cases. It may be an unwitnessed event, as was reported in the first case; therefore, a high index of suspicion of FB ingestion should be entertained in a child who suddenly presents with complaint of difficulty of swallowing especially if there are no obvious physical findings to substantiate an alternative diagnosis. Furthermore, the attitude of holding a toothpick between the lips and at the same time talking or drinking often observed in some individuals especially after taking their meals should be discouraged; this will prevent accidents such as that observed in the second case. Finally, parents should be vigilant and closely monitor their children, especially during their toddlerhood because at that age, they are explorative of their environment and accidental ingestions and poisonings may occur if they are poorly supervised. Alexander W, Kadish JA, Dunbar JS. Ingested foreign bodies in children. In: Kaufmann HJ, editor. Progress in Pediatric Radiology. 2nd ed. Chicago: Yearbook Medical Publishers; 1969. Rajagopalan J, Triadafilopoulos G. Ring(s)-related esophageal meat bolus impaction: Biopsy first, dilate later. Dis Esophagus 2009;22:E14-6. Byrne KR, Panagiotakis PH, Hilden K, Thomas KL, Peterson KA, Fang JC, et al. Retrospective analysis of esophageal food impaction: Differences in etiology by age and gender. Dig Dis Sci 2007;52:717-21. Dahshan A. Management of ingested foreign bodies in children. J Okla State Med Assoc 2001;94:183-6. McPherson RC, Karlan M, Williams RD. Foreign body perforation of the intestinal tract. Am J Surg 1957;94:564-6. Singh RP, Gardner JA. Perforation of the sigmoid colon by swallowed chicken bone: Case reports and review of literature. Int Surg 1981;66:181-3. Ahmad BM, Dogo D, Abubakar Y. Pharyngo-oesophageal foreign bodies in Maiduguri. Niger J Surg Res 2001;3:62-5. Chan YL, Chang SS, Kao KL, Liao HC, Liaw SJ, Chiu TF, et al. Button battery ingestion: An analysis of 25 cases. Chang Gung Med J 2002;25:169-74. Yamamoto M, Mizuno H, Sugawara Y. A chopstick is removed after 60 years in the duodenum. Gastrointest Endosc 1985;31:51. Arana A, Hauser B, Hachimi-Idrissi S, Vandenplas Y. Management of ingested foreign bodies in childhood and review of the literature. Eur J Pediatr 2001;160:468-72. 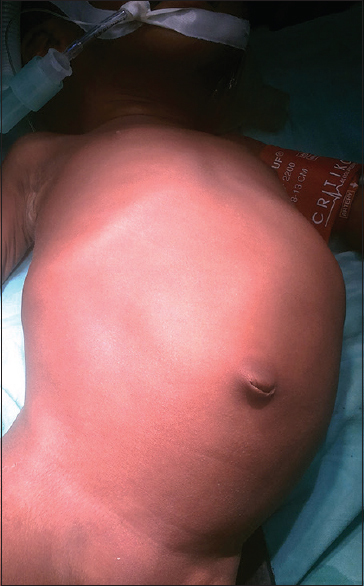 Aliyu I. Esophageal foreign body in a child mimicking a primary respiratory disease. J Med Trop 2013;15:159-61. Cleator IG, Christie J. An unusual case of swallowed dental plate and perforation of the sigmoid colon. Br J Surg 1973;60:163-5. Perelman H. Tooth-pick perforations of the gastrointestinal tract. J Abdom Surg 1965;4:51-3.